In one of the leafy lanes of Khar, you’ll come across a place that reminds you of the pristine beaches in France, where roadside cafes are littered, sparkling in the summer sun. 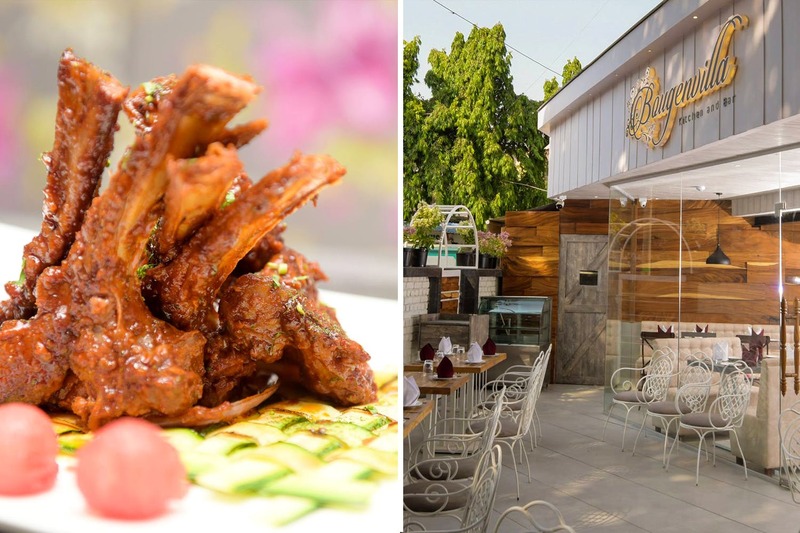 We’re pulling you back to Earth now, specifically Khar, where a beautiful eatery called Bougenvilla Kitchen & Bar exists for all the world to see. You’ll find servers in floral shirts with colourful bougainvillaea flowers on them, sticking to their striking theme. The eatery is divided into two sections, the first level is for private parties, and the ground floor has a bar section on the inside and a gorgeous Al-fresco seating arrangement. The eatery offers you continental, Indian, Bangladeshi and European cuisine, so take your pick from soups or salads, appetisers (mushroom dolmas, choux poppers, tofu, chicken skewers and even feta & corn cigars), a variety of bread and pizzas. For the main course, you can pick from veg and non-veg options (French crepes, baked veggies, chargrilled chicken scaloppini, tenderloin steak), pick from a variety of rice & pasta or even indulge in some veg, chicken or mutton biryani. For desserts, you can take your pick from lemongrass crème brulee, brownies, three-layered cheesecake, chocolate mousse, tres leches cake or your flavour of ice cream. They have a special section in the bar menu called the ‘Bougen Designed Cocktails’ that includes home crafted drinks like the bougenvilla margarita, devil apples, walk & talk, bougen way, whiskyto and even the yuzu cooler. Apart from this, they serve fruit martinis (INR 215), shooters (jagerbomb, kamikazi, rock the floor), Indian and imported whiskey, Patiala tube (bullfrog, longest LIIT), classic cocktails, single malts, rum, gin and vodka-based drinks and even aperitifs and beers. They also have an interesting range of mocktails (plum & cranberry coolers, devil angel, Anarkali) and beverages if you’re into that sort of thing. Date with bae or even a lazy meal with friends, you’ve got a great place to hang out at, so book yourself a table and enjoy the evening. Happy eating!